Come face to face with masked vigilantes of the Black Patch Tobacco War at the Pennyroyal Area Museum’s Kentucky agriculture exhibit. 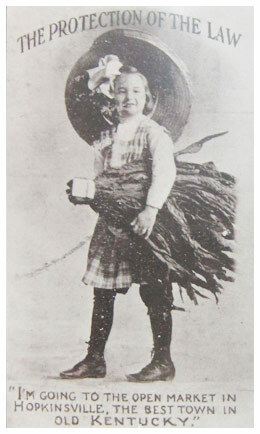 Examine photos, tools of the tobacco trade, and a display of locally-grown tobacco leaves. Buy a genuine Kentucky tobacco walking stick in our Museum Shop. See a mask worn by members of The Silent Brigade, also known as the Night Riders – a secret society of vigilante farmers. Learn how this violent time in Kentucky agriculture led to an anti-trust ruling by the U.S. Supreme Court… in favor of the vigilantes! The history of the Night Riders in the Black Patch region tells of the struggle of small farmers against big business. At the turn of the 20th century, the American Tobacco Company, owned by James B. Duke, formed the Duke Trust. The collective buying power of the Trust forced dark-leaf tobacco (known as Black Patch tobacco) prices to drop – from an average of eight cents per pound to less than four cents. That was two cents less per pound than it cost to grow. Dark-leaf farmers revolted and formed the Planter’s Protective Association. The goal was to boycott the Trust and force prices back up. Farmers who refused to boycott were visited in the middle of the night by Night Riders, allegedly led by Caldwell County doctor David C. Amoss, and “persuaded” to join the Association. Masked riders also burned Trust-controlled tobacco warehouses – including several in Hopkinsville. One Association warehouse in Hopkinsville was accidentally burned in the confusion. The Black Patch Tobacco War ended in 1908 when the American Tobacco Company agreed to the Association’s demands. In 1911, a U.S. Supreme Court ruling dissolved the Duke Trust and its tobacco monopoly. Every year, Museums of Historic Hopkinsville Christian County partners with the Hopkinsville-Christian County Convention and Visitors Bureau to commemorate this event through the Tobacco War Pilgrimage. Be sure to grab your tickets and be a part of the reenactments, tour the historic homes and enjoy great food and hay rides.